When ophthalmologists look at your eyes, they can see more than you’d anticipate. Not only are they able to see the health of your eyes, but they can see if you have other health issues including high blood pressure, diabetes, high cholesterol and even multiple sclerosis and lupus. A thin white or grey ring around the eye, called a corneal arcus, is one indicator of high cholesterol? in younger patients. Eyes are such an important part of the human body that they actually can heal better than most of the rest of your body. They are the second most active part of our body next to the brain and therefore especially require healthy circulation for oxygen and nutrition and the ability to eliminate waste. It is the eyes’ ability to draw what is needed from other parts of the body that supports rapid healing. For example, a scratch on the cornea can heal in just two or three days, whereas a scratch on your skin is going to take much longer to fully heal. This is surprising, since eyes really are quite delicate and they’re susceptible to a number of health issues. Fast healing happens because the cells on the outside of the eye are living cells, unlike the dead cells that make up your skin. It has become a concern to many people that simple everyday activities are going to damage their eyes. Things like sitting at the computer for long hours or reading too much aren’t what actually hurt your eyes. The damage comes when your eyes get fatigued, which can happen in any type of activity where you don’t take breaks and let your eyes rest for a while. Fortunately, simple actions can help such as taking regular breaks from the computer to relax, stretch and exercise your eyes; getting an annual eye exam; eating a healthy diet that includes important eye antioxidants, essential fatty acids; and getting plenty of exercise. When you’re going about your daily activities, you probably don’t count how many times you blink. Blinking is extremely important to the health of your eyes. It surprises most people to realize that, on average, humans blink about 18 times per minute. Each of those blinks lasts about 1/10 of a second, but that’s all the eyes need to rest themselves. In fact, blinking is what helps the eyes naturally heal themselves; it prevents eye fatigue. When you don’t blink for too long, your eyes feel dry, scratchy, and irritated. Studies have shown that when you do focused activity, such as being on the computer, you blink a lot less. As you’re going about your daily life, your eyes are working constantly. In an average hour, your eyes process about 36,000 pieces of information. Of course, when you’re paying close attention to the things that are going on around you, this number skyrockets. The information that your eyes take in can account for up to 80 percent of what you learn through your life. This is why it’s so important to keep your eyes as healthy as possible. School-age children (and younger) process much of what they learn through what they see. Light plays a huge role in our eyesight. It is difficult to see in the dark; however, the eye contains about 120 million cells that help you see better in low light. Called rods, these cells are not sensitive to color. Instead, they are sensitive to the actual levels of light or dark that you perceive. There are also about 6-7 million cells called cones in your eyes that are sensitive to light. Broken up into several categories, these cones are red, green, and blue. The cones are not as sensitive to the actual light, but instead process the colors you see. An unborn child’s eyes form extremely early in the womb. In fact, eyes start forming within the first four weeks after conception. Of course, the early formation doesn’t include color vision, but these eyes can sense light and the changes in light density. At first, the eyes can work independently of one another, and this can continue for a short time after the birth of a child. This is a huge shock to many parents, when their child’s eyes simply don’t work as one unit, which is what most people are used to seeing. There’s a long-standing old proverb that says that carrots are the best thing for your eyes. This food helps you see better in the dark. However, modern research has shown other foods are even more important for vision, such as leafy greens – spinach, collards, and kale – and foods high in omega-3 fatty acids, like salmon, nuts and eggs. These foods will help keep your eyes in good health. You may want to supplement with eye vitamins, antioxidants, nutrients and essential fatty acids. Have you ever noticed how your eyes start shifting around when you’re thinking hard? Did you know that your eyes move, even when you’re sleeping? 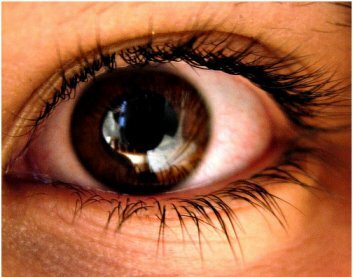 Many scientists believe that the nerves and connections in the eye work with the cerebellum and basal ganglia when trying to remember facts or other long-term memory items. It’s not that your eyes have to move to remember facts, it’s that they do on their own in movements known as micro-saccades – hundreds of thousands of times each day. The purpose of a micro-saccade is to move the image to a different part of your retina. This in turn causes a new neuron in the eye and brain adapt to and interpret the image. The process refreshes your knowledge of what you see every micro-second – otherwise you’d be blind. Your eyes are an interesting part of your body. Whether you’re trying to keep them healthy, or want to know more about how they work, consider these facts. Previous Previous post: What is Optic Neuritis? Next Next post: What are Retinal Tears or Detachments and What Should I Do?